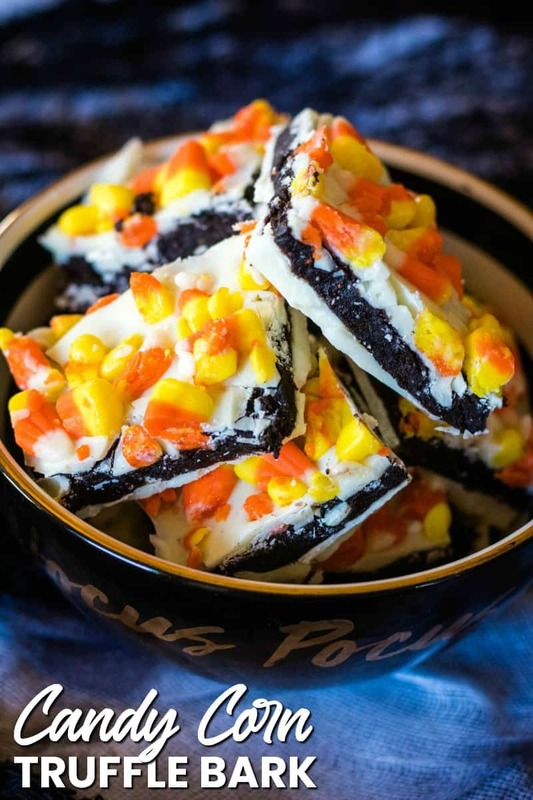 Easy to make and always a favorite at parties, Candy Corn Oreo Truffle Bark Recipe is a make-ahead treat that’ll make all ghouls go wild! Halloween is my favorite holiday! More than Christmas, more than my birthday. It’s just so darn fun! Every year my whole family dresses up (even the dog), we decorate our house and put out all kinds of fun spooky stuff on Halloween to creep out the trick-or-treaters. One of my favorite things to do this time of year is throw a Halloween party! Heck, did you know 34% percent of Americans either attend or throw a Halloween party each year? Get in with the in-crowd kids. When we party, we go in guns blazing. Apple bob, costume contest with prizes, pin the cookie on the jack-o-lantern (kids LOVE this one – the cookies are his eyes! ), and of course, lots of Halloween themed food! The kids AND adults always have a blast because Halloween is fun for everyone! This year I came up with a super fun treat to add to my party spread! This spin on a classic cookie truffle turns it from normal to paranormal! 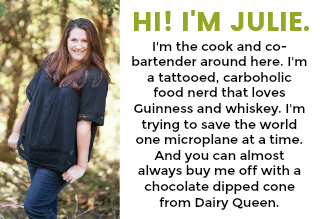 Okay, maybe they won’t slime you, but oh man is this truffle bark recipe good! 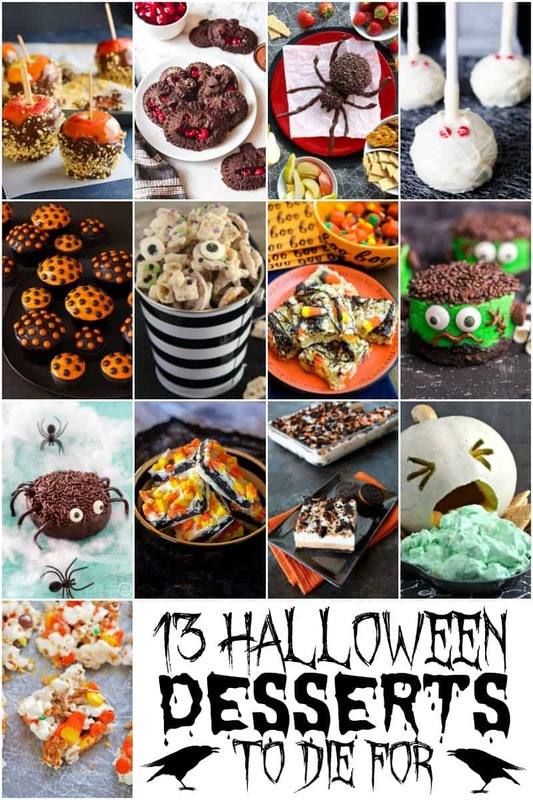 And they look totally awesome on the table with bone breadsticks and “blood” sauce dip, Frankenstein cereal treats, Reese’s Peanut Butter Pumpkins, and all other kinds of fun Halloween party ideas! If you’re ready to go over the top with your Halloween spread this year, you are in luck! We have 13 Halloween Dessert to Die For with your name all over ’em! From mummies to Frankenstein and spiders to puking pumpkins, there’s a scary good treat for everyone! Easy to make and always a favorite at parties, Candy Corn Oreo Truffle Bark Recipe is a make-ahead treat that'll make all ghouls go wild! Place a glass bowl over a medium saucepan filled in 1-inch of water. Bring the water to a simmer over medium-low heat. Place the white chocolate chips in the bowl and melt, stirring occasionally. (Do not overheat chocolate or it will seize. Line a 9-inch x 9-inch baking dish with waxed paper. Pour half of the melted chocolate into the dish and spread into an even layer. Transfer the baking dish to the freezer to let the chocolate harden. Return the melted chocolate in the bowl back over the simmering water. 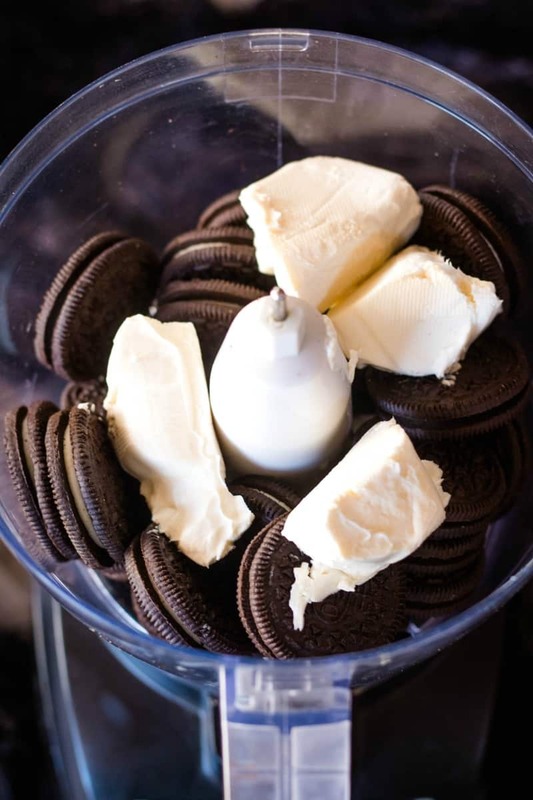 Place the Oreos and cream cheese in a food processor. Pulse until cookies break down, using a spoon or rubber spatula to stir things around as needed. 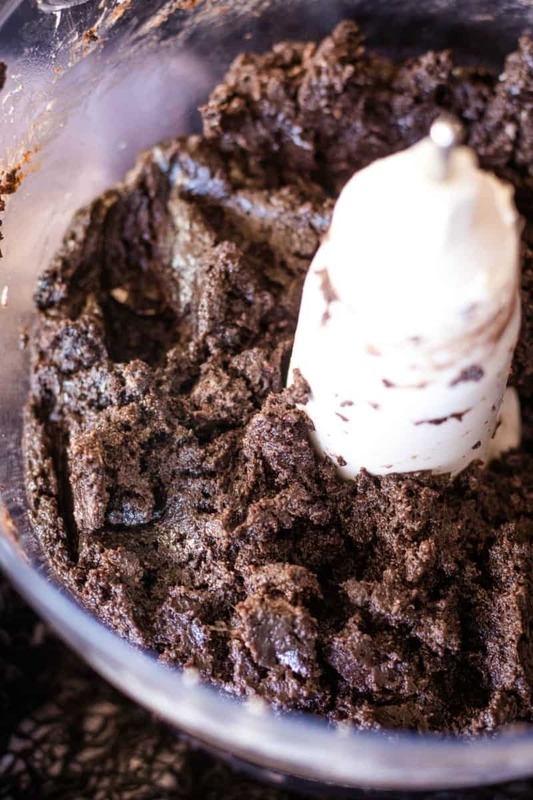 Process the truffle mixture until smooth and evenly combined. Pour the remaining white chocolate over the truffle mix and spread evenly over the top. 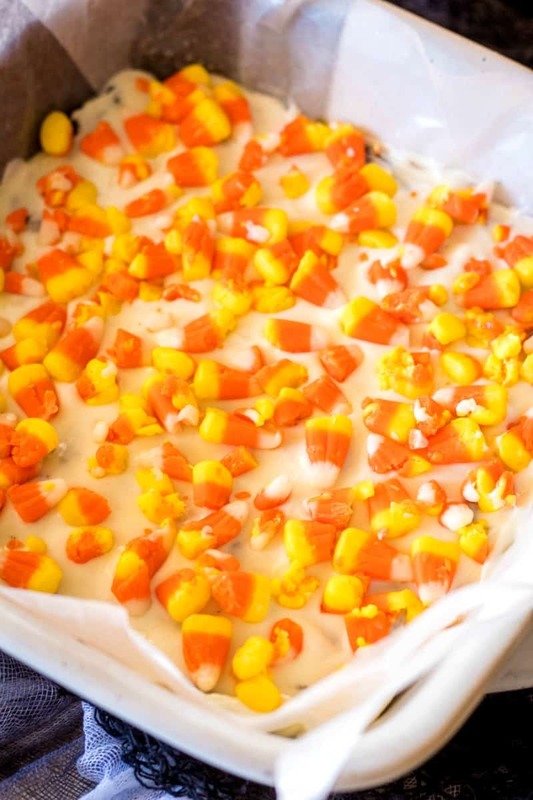 Sprinkle candy corn (whole or chopped up) all over the white chocolate. Refrigerate for 1-2 hours to let the chocolate and truffle mix set up. Remove the candy from the pan, pull off the waxed paper, and use a knife to cut the candy into good-sized pieces. Store in the fridge. If you'd like to make candy corn colored truffle bark, substitute Golden Oreos for chocolate and make these changes. Add orange gel food coloring to Golden Oreos once truffle filling is mostly completely blended in food processor. You may need to use a rubber spatula to help color the truffle filling evenly. Add more food color as needed to reach a vibrant color. To the remaining half of the melted white chocolate chips, add yellow food coloring until a vibrant color has been reached. Pour this on top of the truffle filling layer. 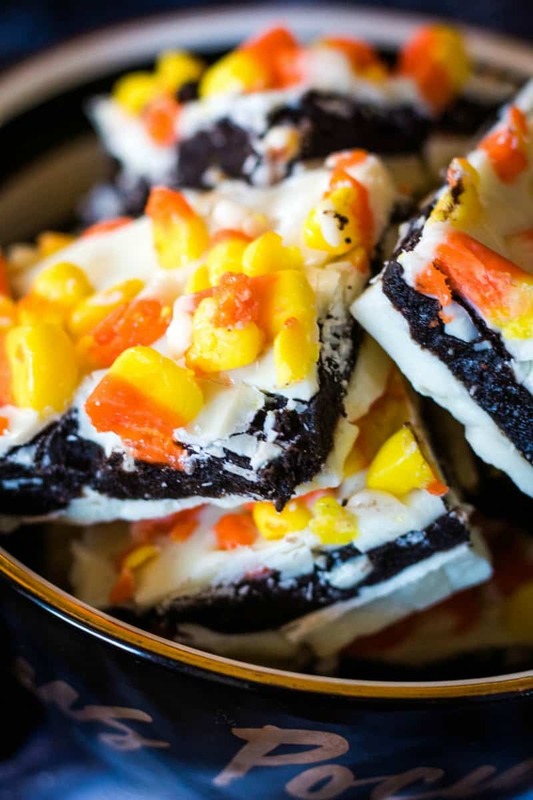 Candy corn is one of those “love it or hate it” Halloween candies and girl, I LOVE IT. I could eat this truffle bark all day long! Oh my yum! I can’t believe this is only four ingredients! 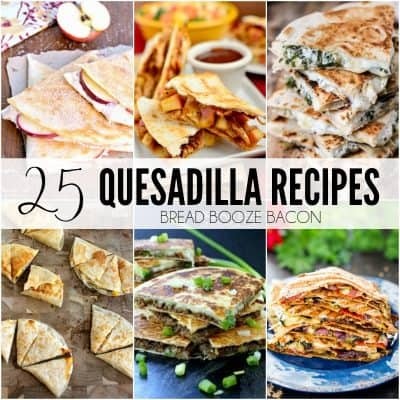 I’ve got to try it! I love a festive make ahead treat. Great for school Halloween favors for students and teachers 🙂 Thanks for sharing! 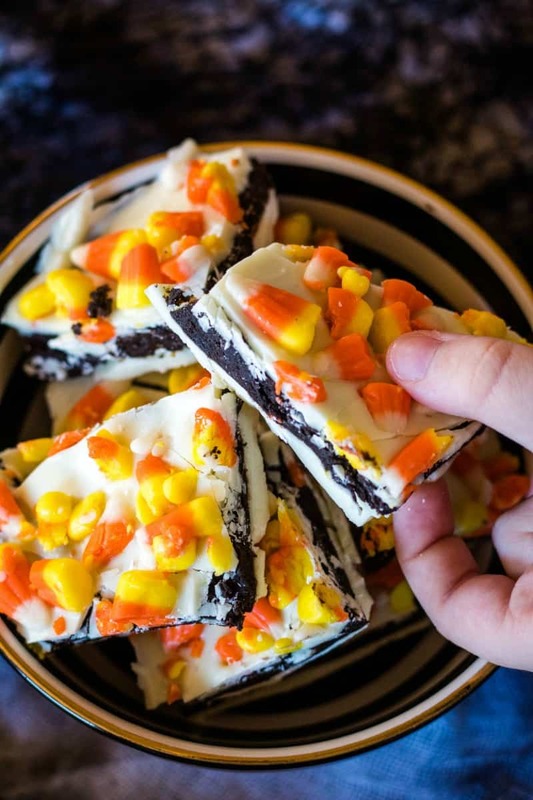 So easy and fun for Halloween- we love bark recipes and it went fast!